Glendora QB Matt Fink named Offensive MVP at Saturday’s Blue Grey All-American SoCal Regional Combine …. Glendora QB Matt Fink was named Offensive MVP at Saturday’s Blue Grey All-American Southern California Regional Combine held in Ventura. Fink is one of the top QB prospects on the West Coast and already has offers from Boise St. and Washington with plenty more likely to come. The fact Fink can run probably is a huge boost in competition like Saturday’s. But he also has big-time arm strength, something local fans often don’t get to see showcased during the regular season. 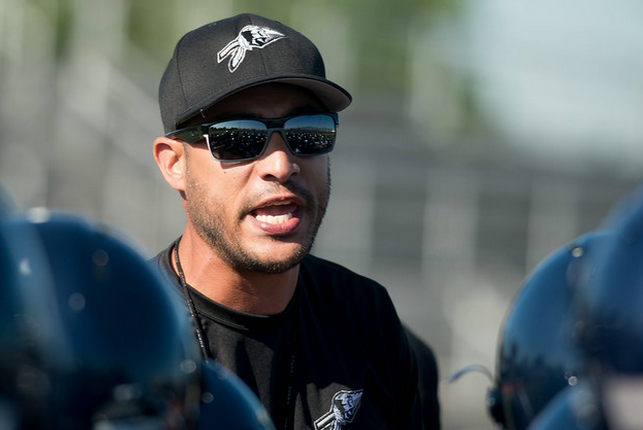 Daniel Algattas resigned earlier this week as head coach at Baldwin Park in order to take a promotion at Mt. SAC. Baldwin Park AD James Heggins, himself a former Braves head coach, said the school has immediately began the search for the next head coach and said the position will be an on-campus position. Heggins also ruled himself out as a candidate. The Braves were 6-5 under Algattas and finished in the second in the Montview League. Baldwin Park lost in the first round of the playoffs to San Dimas. Former La Serna assistant Frank Gallardo is the new head coach at South El Monte, Aram learned from a South El Monte administrator at the Eagles’ CIF playoff basketball game on Wednesday night. Gallardo replaces Ibis Aguilar, who was let go by the school after a four-year stint that saw him lead the Eagles to a share of the Mission Valley League title in 2012. Editor’s Note: I’m deleting Chino Hills from consideration. It pains me to do so, but they’re not in a local league any longer and it was problematic ranking them last year because of it (and because they beat whipped Amat and that made rankings even more difficult). Love the Huskies. Protest to CIF and your area, and get back in a local league (for us). 1. Bishop Amat — Forget the SGV, this is one of SoCal’s top teams. 2. Charter Oak — Leading passer, rusher, receiver all back. 3. Glendora — QB Fink is back and that’s enough for me. 4. St. Francis — Losing WR Crawford a big hit, but plenty of upside. 5. La Mirada — Reloading as we speak. 6. San Marino — Prediction: Will beat Monrovia. Central Div. semifinalist, too. 7. La Serna — Lots back on defense. Program just reloads. 9. Northview — Tons of key returnees on offense. 10. Pomona — QB Lockett back, but big losses elsewhere. 11. Los Altos — Nevens and rest of junior-to-be class is strong. 12. La Habra — Hard to get too excited until defense improves. 13. Damien — Dangerous RB to build around. 14. Monrovia — Hard to see Wildcats being better than ’14 edition. 15. Muir — Lots of key players have to be replaced … but there’s talent. 16. South Hills — Like the trajectory of the program. 17. Bonita — QB East back along with some key players on D.
18. San Dimas — What impact will coaching change have? 19. Diamond Ranch — Always talented, but any better than ’14? 20. La Salle — Program took a hit in ’14. Can it bounce back? 21. St. Paul — Defense has top tacklers back. 22. Claremont — Arrived a year early last season. Look out now. 23. El Rancho — Losing one heckuva senior class. 24. Montebello — Defending Almont champs as leading rusher back. 25. Azusa — Leading pass/receiver back. Offense will be legit.